In celebration of July 4, Independence Day in the United States, Transformation asks what lies in store for democracy in America? 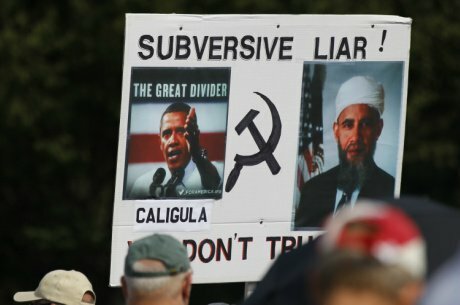 Sign at a Tea Party rally in Washington DC. Credit: Demotix. All rights reserved. "And you know what? I think he's very aware of what he's doing. I think he really knows how he is hurting the country." As a conservative who lives in a conservative stronghold of the USA, I regularly hear this kind of dinner table commentary. At the point where Obama’s malevolence is mentioned, I can’t resist stepping in by saying "I have to disagree with you there. I know lots of people who think like Obama - and all of them really do believe their plan is going to benefit America." "What you might not be appreciating," I usually add, "is that Obama is coming from a very different story about the world than we conservatives do. And if you take that narrative as your starting point, it leads you to a very different set of decisions in terms of what is best for our country." And that's where I lose them..."Hmmm...ok, thanks for sharing.” (Translation: “I still think Obama is a demon”). Once we adopt this view, those who disagree with us are no longer simply reflecting a different understanding of the world. Instead, any difficulties in the conversation confirm our feeling that the other side is unreasonable, ill-informed, biased, and badly-intentioned. And why would you ever talk to someone like that? That’s why I believe it’s crucial that we pay careful, regular attention to the narratives that surround us. If we’re not listening to the ways that distinct and powerful stories shape our experiences, then we’re more likely to demonize, vilify and condemn our political opponents as ignorant or unworthy. That isn't the best way to start a relationship, let alone move towards collaboration and shared work together. Let’s take an example. There’s lots of talk across the world these days about helping those who are poor. Despite popular stereotypes, liberal, progressive and conservative communities in the USA all hold to narratives that value helping those in need. But exactly what that means in practice, of course, varies in fundamental ways. Conservative narratives famously pay attention to the importance of individuals doing what they can for themselves as part of the helping process. In our view, passivity, dependence and over-helping are real issues - with the potential to become even bigger problems than those we are trying to address in the first place. Although my liberal and progressive friends aren’t necessarily unconcerned about these issues, they seem much less central in their own story of helping. Instead, their narrative focuses on the urgency of providing help - 'let's get people health care and get businesses back on their feet' - with less concern about the potential side effects of over-helping and dependence. The point is this: different policies make sense depending on which narrative of helping is taken up. Hence, President Obama presses for mandated health care and economic stimulus while conservatives scratch their heads in confusion. What would it mean if we really grasped the differences in our narratives and stories? Could it influence our ability and willingness to work together? I think the answer is “yes.” Take the large divide that exists around environmental issues. In liberal and progressive narratives, the impact of human beings on the earth's environment is often taken to be the biggest threat to human life. Discussion centers on ways to protect the environment in the face of economic growth. For conservatives, however, caring for the environment is rarely the first focus in our narrative, even though we do care about it. Instead, it is “social climate change” that we perceive as the biggest threat to human life – the shifts away from norms and values that we see as central to a healthy society. Without denying the potential of serious problems that arise from growing carbon emissions, avoiding future calamities depends for us on the size of our collective "moral footprint." These differences are real and have to be acknowledged as the basis for any meaningful conversation, but the good news is this: once they are understood there is much more room-to-maneuver for compromise and collaboration. Most of the conservatives I know really don’t want to trash the environment. Likewise, I've never met any liberal or progressive individual who advocates for more adultery in society. Rather than grappling with an unbridgeable chasm between different human beings - the angels and the demons - we might enjoy exploring the contrasts in emphasis, priorities and moral vision that exist between equally-thoughtful and well-meaning people. Once we grasp this position, many possibilities emerge. There are many surprising ways in which diverse citizens are talking and working together in the rough-and-tumble of American politics. For example, people with radically different views are trying to find some common ground through “Living Room Conversations” and other efforts to develop a different quality of political debate. America’s military budget is being curtailed by unusual alliances between liberals, conservatives and progressives. “Slow democracy” is being modeled on the “slow food” movement which originated in Italy and France. And a Marxist decides to visit with the Tea Party. The bottom line running through these experiments is simple: smart people with good hearts disagree about the nature of almost everything in the world. Once we embrace this reality, new relationships become possible. In particular, we can practice the art of deep and vociferous disagreement while respecting each others' worldviews and backgrounds. What could that mean for potential political compromises, collaborations and the future of social change? Make no mistake - it could mean everything.